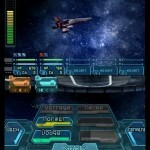 A couple weeks back, I finished playing a DS game called Infinite Space. It came out a while ago, and I just managed to get around to starting it back around the first of May. All in all, I was very impressed with the game. Infinite Space can be best described as a Japanese RPG, but instead of fighting orcs, elves and giant eyeballs, you’re in a space ship fighting other space ships. Seems pretty cool, eh? To RPG it out even more, you not only get 1 ship, but a whole fleet of them. AND, you can customize your ships too, from what kinds of weapons each ship has, to what modules are in the ship, like Crew Cabins, cargo hold, Sick Bays, engines, bridges, and many, many more. Oh, and to top it all off, you also assign crew members to different posts in your fleet, like First Officer, Chief Engineer, and even Head Chef. Yeah, this game is an RPG in the true sense of the genre. The game starts out as the main character, Yuri, discovers a crashed ship on his home planet. He helps the pilot get the ship ready, and she (Nia) takes Yuri along for the ride. You pick up new crew members and other characters along the way, do quests for various people, and discover this incredible force that enters your galaxy and wants to take it over. It’s kinda your standard plot, but I’ll tell you, the storytelling is really good. I couldn’t put the game down. I just wanted to see what would happen next. It’s got some of the Japanese RPG-type characters and such (like the quiet, but concerned hero, beautiful side-kick with very revealing clothing, and other stereotypes), but hey, this was created in Japan, right? It’s part of the charm. As for the gameplay itself, as I said above, you have a fleet of ships. You’ll fly around from planet to planet, sector to sector doing the story missions and side quests, and you’ll get into random space battles along the way. When a battle starts, you’ll have a meter that fills up (think the ATB meter from any of the SNES-era Final Fantasy’s). When your turn comes up, you’ll use a portion of this meter to either Dodge, Attack, or Barrage (super attack). Regular attacks take up 1/3 of this action bar, and they are just that…regular attacks. A barrage though uses up 2/3’s of the bar and hits the enemies with a much stronger attack, except that it can be dodged. Hence this is where dodge comes into play (which itself takes up 1/3). Once you get into the battle system though, it’s pretty simple to understand. Later in the game, you’ll gain access to special First Officer powers (depending on what crew member you put in your first officer slot), fighters, and Anti-air guns to combat fighters. All these make for some interesting battles. There’s also melee battles, which if I were to pick a weak part of this game, this would be it. You have 3 attacks to choose from: Leadership, Slash, and Shoot. Leadership beats Slash, Slash beats Shoot, and Shoot beats Leadership. Each side has a bar that starts to tick up as soon as you make a selection. This then gives the other side about 3 seconds to choose an action (and their bar starts to tick) before you actually switch to your action. The AI tends to be totally random though on it’s choices, so there’s no logic here…just straight up guessing, and hoping you guess right. There are a few things you can control, like your health and attack strength, but if you never guess right, it won’t matter. I tended to just load up on health and attack, and hope I got lucky. The main story takes you across many different systems, and you do meet many different characters along the way. It took me over 55 hours to beat this game, so it’s not for the light-hearted (mind you, I was farming for some of the best ships and components in the game, so naturally this takes a bit longer). If you’re able to put up with the length and a bit of the JRPG-stereotype stuff, this is a must-play game, and worth every penny. Overall, I’d give it a 4/5. You can find it on Amazon.ca (kinda expensive) or just try searching on Ebay (if you can get lucky and find a copy for around $40).